Stroller and play quilt for baby Weil. Fabric: top pieced with Robert Kaufman Kona jelly roll in New Bright Palette; backing and binding are black and white prints from Joann. Batting is Warm & Natural 100% cotton. Top is pieced by machine, and binding was also done by machine. 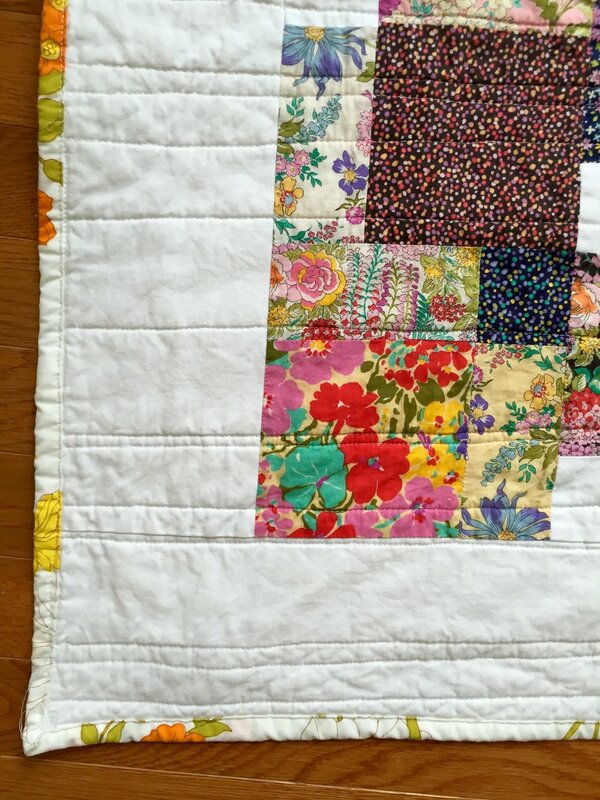 Long arm quilting by Saybrook Quilting Studio. 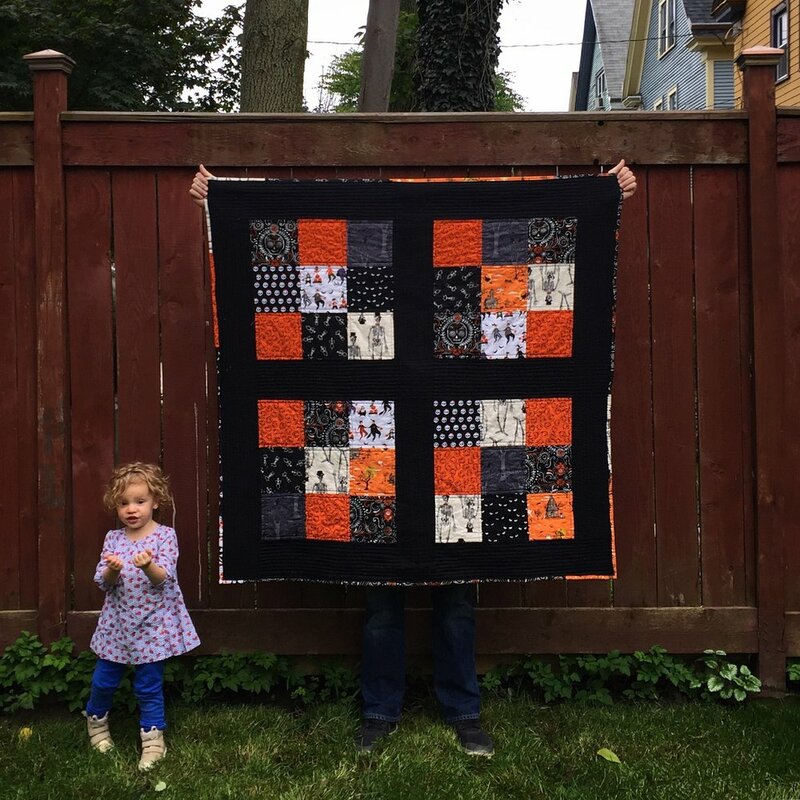 Large throw quilt for my family to use during the fall. Fabric: variety of prints from Andover, Windham, and Joann. Batting is Warm & Natural. Quilting done by me on my domestic machine using a walking foot. Binding attached by machine. Collaboration with Shawna Desrosiers for our friends Stephen and Rachel. Shawna and I each made wonky pinwheel blocks from blue/grey fabrics and scraps in our personal stashes. I hand-dyed the backing fabric with indigo using a shibori resist-dyeing process. Shawna pieced the blocks together, free-motion quilted all the blue/grey pinwheels, and bound the quilt (because she's awesome). Hand-dyed with indigo by me. 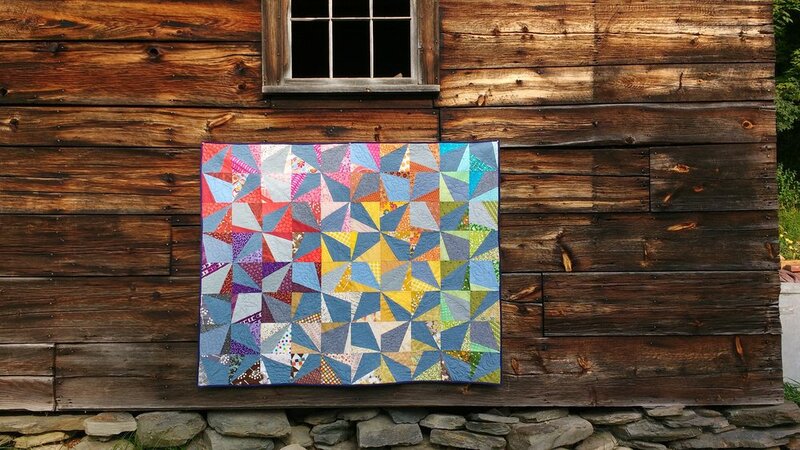 Crib sized quilt for use by my kids, nieces, and nephews at our family cottage. I used double-disappearing nine patch to piece the top. Fabric: Regent Street charm pack from Moda; Robert Kaufman Kona in white. Backing and binding from a vintage sheet.